The second Vertical Atlas event focused on the Russian digital cosmos. How does a country with a tradition of central planning cope with the decentral internet and powerful foreign cloud-platforms? With Svitlana Matvyienko and Ksenia Tatarchenko. The Russian 'Stack' is inseparable from how it's technocratic planned economy has been (and continues to be) a nation-building project fraught by geopolitical tensions. The story is much deeper than trolls and hacks. In fact, the internet could have been Russian. In the Soviet Union, ideas and designs for a nationwide cybernetic network had already been developed in the late 1950's, inspired by a long tradition of artistic and philosophical speculations about the possibilities of technology. Cultural movements like Cosmism, Suprematism and Constructivism and their experimentation with metaphysical models derived from mathematics and mysticism informed these techno-scientific developments in unexpected ways. Since the 2010's, powerful foreign tech-platforms have been forced to base part of their cloud data servers on Russian soil, behind state-controlled online gateways. Telegram, the popular Russian message service, was requested to share its encryption keys with the government (but refused), resulting in a boom in VPN service providers virtually locating Russian citizens and companies outside the country. Such frictions between different models for state-scale platforms spur attempts at cross- and retrofitting that range from the clever to the clumsy and they engender unpredicted geopolitical effects. As the dynamic between how stacks are governed becomes yet more contentious - state centralization, private decentralization, platform centralization, public decentralization, the remarkable aspirations and debacles of the Russian stack form an essential model to investigate. Svitlana Matviyenko is an Assistant Professor of Critical Media Analysis in the School of Communication at Simon Fraser University, Canada. Her research and teaching are focused on political economy of information, infrastructure studies, history and philosophy of science. She writes about the networking drive and user complicity, practices of resistance and mobilization, legacies of the Soviet techno-politics, including the Chernobyl catastrophe, information and cyberwar. She is a co-editor, with Paul D. Miller, of The Imaginary App (MIT Press, 2014), (with Judith Roof) of Lacan and the Posthuman (Palgrave Macmillan, 2018) and a co-author (with Nick Dyer-Witheford) of Cyberwar and Revolution: Digital Subterfuge in Global Capitalism (Minnesota UP, 2019). Ksenia Tatarchenko is a lecturer at the Global Studies Institute, Geneva University, specializing in the history of Russian science and technology. She has held positions as a visiting Assistant Professor of History at NYU Shanghai and a post-doctoral fellow at the Harriman Institute, Columbia. She was affiliated with the EUSP project “Russian Computer Scientists Abroad.” Most broadly, she studies questions of knowledge circulation to situate Soviet developments in the global context. Her publications reconstruct the formation of the Socialist Information Society from multiple perspectives, such as discipline consolidation, education initiatives, hobbyist communities, and gender issues. 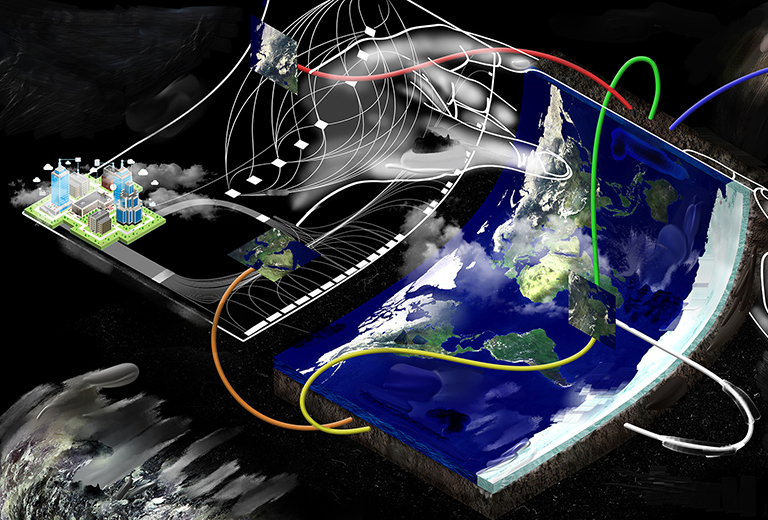 Vertical Atlas is a series of five events that attempt to develop a techno-political cartography, departing from the conceptual model laid out by Benjamin Bratton in The Stack. This series aims at investigating specific geozones where the entanglement of different sovereignties surface and different stacks clash. Each event consists of a public program in Het Nieuwe Instituut and a research lab for invited guests. Vertical Atlas is developed and produced by Hivos Digital Earth and Het Nieuwe Instituut.